If Victoria’s La Trobe University was in any doubt that accepting $15 million from vitamin manufacturer Swisse Wellness would cause controversy, yesterday’s resignation of Ken Harvey, the University’s most prominent public health academic, clarified the issue. The $30 million Complementary Medicines Evaluation Centre plans to receive half its funding from Swisse, yet the University claims that all research would be independent. According to a 6minutes report yesterday, Adjunct Associate Professor Ken Harvey suggested in his resignation letter that the University press release sounded like a plug for Swisse. Dr Harvey has an impressive track record of raising complaints against companies who make false therapeutic claims about their products, often on behalf of Choice, the Australia Consumer’s Association. He noted that Swisse has been a repeat offender at the independent Complaints Resolution Panel. Yet Medical Observer quoted a Swisse spokesperson who claimed that research into complementary medicines is exactly what the industry needs and what their detractors had been asking for. So, as a promoter of evidence-based health research, is Dr Harvey being precious? Not at all. I admire his stance, because it will be hard to ever take seriously any research coming out of the new centre, and the very independence of La Trobe University is at stake. So, how can solid scientific research come up with a misleading result? The multi-billion dollar vitamin industry has a track record of cherry picking small studies, combing through multiple possible outcomes to find any which reach statistical significance. One of the aims of this investment by Swisse will be to churn through enough trials to come up with just such evidence, so watchdogs (and public advocates like Ken Harvey) can no longer legally require that they remove claims from product promotions. Sit back and let me put you in charge of a research trial for a moment. Say you run a randomised control trial (RCT) of vitamin X versus a placebo control. If the vitamin doesn’t help anyone at all, the measured outcome will be the same in the two groups. But you are trying to find a difference between the two groups which is statistically significant: defined as a less-than-one-in-twenty probability of something occurring through chance alone (called p<0.05). For any given outcome (e.g., did the people taking the vitamin live longer? ), a false result probably won’t occur by chance alone. However, as you keep measuring more outcomes, eventually one of them by chance will reach ‘statistical significance’. This would be expected every 20 measurements. So what happens if you measure 40 outcomes? This is not as hard as it sounds. You could ask participants to rate lots of different symptoms on a scale, or look at any number of ‘sub-groups’ divided by age and gender (e.g., leg cramps in females aged over 60). Of the 40 outcomes, two will be ‘significant’: one might show the vitamin is worse than the placebo pill, and the other that it is better. If that better outcome is answering the question, for example, ‘How would you rate your energy score in the afternoon?’, then bingo! The company can now advertise that independent La Trobe University scientific tests have proven that vitamin X pills enhance your energy. The dose and formulation will be specific to the company brand, because part of the funding arrangement will be supplying pills for the research. Celebrities and sportspeople will now be safe making that claim on TV, and press releases will ensure that the mainstream media picks up the story…some might even call it a ‘medical breakthrough’. Daytime TV will disguise the advertorial as a news topic for their resident expert to discuss. See US website Health News Review for hundreds of examples where all this has happened. So Swisse’s generous $15 million is actually a judicious investment in marketing, entirely consistent with long-term profit for the shareholder, and promoted under the research budget…after all, who would argue against research? The La Trobe PhDs doing the research will be independent, in that they are not paid by Swisse, but they also have a lot to gain by getting their article into print…and it will be overwhelmingly easier to publish a positive finding than a whole bunch of negative ones. The All Trials campaign highlights this important problem of ‘publication bias’. Thus, a quality trial (an RCT) done by well-meaning university researchers can create a situation where a result which isn’t actually true (it is not ‘reproducible’) gets publicised widely in advertising. The payers who prop up the whole system are the consumers who believe that they are using a ‘scientifically proven’ product for their tiredness/weakness/uncleansed liver etc. Mine is a sceptical viewpoint, but I’m afraid this is just the way the industry works. I was pleased to see today that the Friends of Science in Medicine has backed Dr Harvey’s position. I am a senior lecturer at two Australian universities and I would also be very troubled if one of them compromised its independence in this way. Good on Dr Harvey for his brave stance. 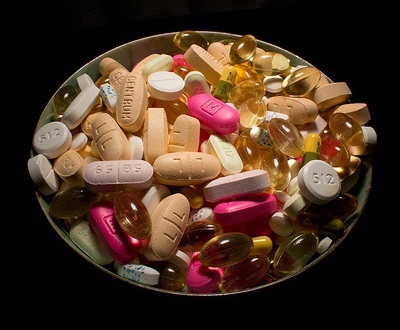 This entry was posted in medical writing and tagged evidence, Ken Harvey, overtreatment, pharmaceutical, vitamins. Bookmark the permalink. 12 Responses to La Trobe Uni climbs into bed with Swisse; Prof Harvey climbs out. Great analogy and explanation, as always, Justin! Swisse have too much money and authority now. Nobody will be able to stop them. Maybe you’re right. We might not prevent blatant conflicts of interest but, as a fellow medical writer, you’ll recognise my urge to speak up about it! * Prof Paul Glaziou has said that Bond University rejected a similar approach by Swisse in late 2012, due to conflict of interest concerns. A beautiful explanation of a fairly complex phenomenon – thank you Justin! In case the positioning of my reply below confuses anyone, Jan is my mother, not Genevieve. I have no reason to suspect either of them were confused at any point. Just when I’m trying to maintain a professional, no-conflicts-of-interest approach, along comes this suspiciously positive comment from someone with a distinctly vested interest in my writing. The surname and eight kisses at the end are the giveaway. Ah well, I do tell my writing/social media workshop participants to never publish anything they wouldn’t want their mother to read. For this, and for everything, thanks mum! Feeling a lotta love in the (virtual) room. Now that the mutual admiration has settled down, would you care to comment on my memo showing the televised comments by righteous advocate of ethical conduct Prof Komesaroff to be somewhat hypocritical? Monash specialists taking consultancy fees and research sponsorship from Pfizer for pushing antidepressants – against patient wishes. Say it aint so, Dr Coleman! Thanks for your views, fnmyalgia. Certainly no suggestion of silence – let alone resounding – on my part! If you look alongside your submission to the ACCC, you’ll find the RACGP submission. Although it doesn’t have my name listed in the title, I wrote the whole submission, which is comprehensive, and doesn’t hold back from criticising the proposed Medicines Australia model of transparency. Apologies, Dr. I’d been reliant on http://medicinesaustralia.com.au/files/2013/09/Royal-Australian-College-of-General-Practitioners-RACGP.pdf since the ACCC had been tardy in posting your own contribution. Altho’ I think the RANZCP’s addressing of the issue of research in Sn5.3 proved them to be no shrinking violets. Interesting 2nd take on the Sunshine Act at Medscape in article 829691 yesterday. Practitioners fearful of being “blacklist”ed by an enhanced reporting!